No Vacansea Fishing Charters, specializing in various fishing tactics (both inshore and deep sea) off the coast of South Florida. We are convenient for guests in the area from Fort Lauderdale down to Hallandale Beach, including Hollywood, Hollywood Beach and Dania Beach. The beautiful weather provided to us from the vast Atlantic Ocean makes day trips very enjoyable on our Andros Offshore 32 for the exciting day of fishing awaiting us at the various oceanic fishing spots. Learn more about our fishing trips - what to wear, what to bring and what we recommend. Interested in booking a fishing trip? Just call 954-632-9340 or get in touch here. No Vacansea has fished for years, Charter Boat Captains Mario Cote and son, Kevin Cote, both share a deep passion for the exciting sport of fishing, and would love for you to embark on this adventure onto the water to bring to surface some exciting sport fish such as Kingfish, Dolphin, Sailfish, Wahoo, Tuna, and Swordfish all of which are lurking on the bottom. 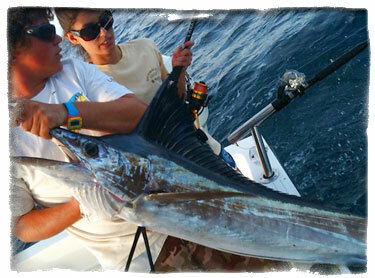 Like us on Facebook and experience our fishing adventures in South Florida:.